A good portion of our business comes from emergencies, this meaning customers call once their AC is already beyond salvation. There are some key things you can look for that may tip you off that your AC may be getting ready to quit on you. If you are able to catch onto these symptoms before hand, there is a good chance that you could be looking at a relatively inexpensive AC repair, versus a full on replacement of your unit. The first thing to look for is excessive noise. AC units are designed to run quietly and efficiently. If you are beginning to notice your AC unit more, and is making noises that are not normal, it may be time to call in your local AC repairman. Another key symptom of your AC needing repair is weakened airflow. If you notice that you have weaker than normal airflow, before you go jumping to conclusions, be sure to check to see if your air filter is not clogged. If you don’t change your air filter on a regular basis, you can expect to see weakened airflow. If you change your filter and see a dramatic improvement, great! That is probably where you issue resided. If you change your air filter though and nothing improves, you will want to give you AC repair man a call to get the issue fixed before it’s too late. The last and most obvious sign that your AC unit may need a tune up is that the air coming from it isn’t cool. If your system is taking more time to get your home to the desired temperature, or is blowing out warm air when it should be blowing out cool air, you need to have it inspected and repaired immediately before you have an expensive replacement on your hands. 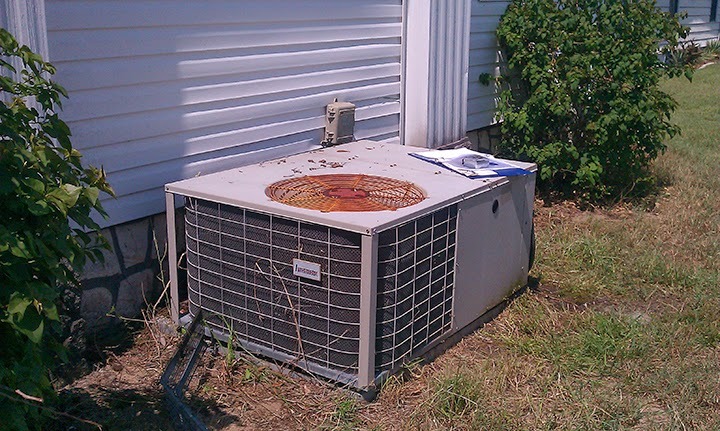 Your AC unit should be running without you even really noticing it is there. If you believe you may have an issue with your AC, feel free to contact us today to see how we can help get your AC back up and running efficiently. Question: Why does the A/C system need to have a drain line? Answer:1-The drain line is one of the most important parts of the air conditioning system. 2- The drain line carries the water the air conditioning system produces result of the dehumidification process out to the outside. It is a plastic PVC pipe that is connected to the air handler, it goes from the air handler to the outside. Installation configuration of drain lines varies from system to system. Dehumidification on these residential air conditioning systems occurs every time the air conditioning is working in cool mode. The air mixture inside the house or the place being cooled contains certain percentage of humidity. That humidity needs to be controlled and maintained at certain levels to avoid issues like mold, etc… While the system is engaged in cool mode, the temperature of the evaporator coil, the panel that cools the air inside the air handler is colder than the dew point of the water vapor of the air mixture passing through it. It causes the water vapor to condensate on the cold metal surface of the coil and change state from water vapor to liquid water. That water must come out some way some how, that is why the A/C system needs to have a drain line. Question: Why the A/C Condensate drain lines get clogged? It comes down in part to Indoor Air Quality. The mixture of air that crosses the air handler is not 100% clean, even using the best air filtration system available solid micro particles of dust, organic particles like mold spores, etc… in the air are going to pass through the filter. Once on the other side they get stuck in the evaporator coil and helped by the water the coil produces part of this material gets down into the evaporator coil drain pan. Due to the conditions present inside the air handler where the evaporator coil is located some organic matter like mold spores and bacteria start to grow in the surface of the coil and inside the air handler. Once part of this matter gets to the drain pan, water then tries to push it out of the system but the water flow is so passive that those solid particles tend to settle at the bottom side inside the drain line specially in horizontal sections. Add also the mold growth inside it. Over a period of time and if the drain line gets untreated the build up inside increases forming the clogs that ultimately restrict the water flow causing the drain line to get clogged. Question: Why is so important to have the A/C drain line clean? Answer: As mentioned above. The A/C drain line is one of the most important parts of your air conditioning system. In case it malfunctions other issues like water damage and mold, appear costing homeowners extra money in repairs. Once the AC drain gets clogged, it may lead to water leaking in the line resulting to extensive damage on the wall, ceiling, and the carpet and wood floor in your home, other damages caused by clogged drains include damage to the return duct plenum, wood platform where the Air Handler is installed (Installed vertically in Garages, Closets, etc…). This causes the wood to weaken and over a period of time if the drain is not properly cleaned the unit start to sink on the platform causing it to get out of level causing more problems. If the Air handler is installed horizontally in the attic or below the ceiling in the garage or horizontally in any other confined space then water starts to accumulate inside the unit causing the insulation to get wet, then this water starts to migrate outside the unit into the secondary drain pan and outside if the secondary drain line is in good shape and properly connected to the drain pan and clean. If the secondary drain pan does not have a secondary drain line connected then the water starts to accumulate in the pan. If the drain pan does not have a safety float switch then it will get filled and water will start to migrate outside causing all kinds of damages in the area around. Clogged drains account for a good percentage of the service calls air conditioning companies have to deal with in summer. As homeowner you must avoid these situations from happening. Question: How we homeowners can avoid clogged drains from becoming a big issue? Answer: You can avoid this problem by simply cleaning your AC drain and thus avoid the extra expenses you would incur from repair much later. One way to avoid this is to have the drain to be cleaned at least once a year. Many companies suggest doing it twice a year. Drain cleaning procedures vary from company to company and from technician to technician. Here at North Pole Air Conditioning and Heating Services, Inc. we believe if the drain is properly cleaned once a year is more than enough. To prove it we made a test. We had an A/C drain (50 Feet long, horizontal run) cleaned properly, exactly the way we describe below. It took two and one half years to get clogged again up to the point that it drained into the platform. So, if a proper drain cleaning is performed, only once a year is enough. We are really proud of our zero incidences of recurrent callbacks service calls due to drain issues. How do we do it? We vacuum, flush, chemically treat and test the drain line, including complete cleaning of the evaporator coil drain pan which is the place where all the dirtiness of the drain line starts to accumulate. We use a combination of water pressure from the house piping system, vet-dry vacuum, special drain cleaning chemicals (NO VINEGAR OR BLEACH) and pan algae tabs. At the end of the process we test the drain line by creating a simulation of the system making water; we spend time observing the pattern of behavior of the water coming out of the system, go back and forth making sure the system is draining properly like if it is working full throttle. At the end we guarantee that the system will drain the way it is intended and that particular drain to be the cleanest of the neighborhood. Here at North Pole Air Conditioning and Heating Services, Inc. we make sure that everything comes out perfect, the way our customers expect and the only way we know to guarantee what you want most: COMFORT. This is the time of the year in which many of you decide to invest in a new and more efficient HVAC system. It is exiting and good to know that you can be able to replace your old and inefficient HVAC system that probably is draining your wallet making you pay a lot of money in energy consumed. We want to share with you some important tips that you need to know before hiring the company or individual contractor to perform the installation. 1- Make sure that the company performing the installation gets the job inspected by the County Building Department. This is extremely important because it assures that the installation was performed according to the current building codes. This means PROTECTION for you as consumer. 2- Make sure new Refrigeration Lines are installed. The reason: Old lines are contaminated with R-22 the Freon that probably your current old HVAC system uses and the one EPA is phasing out, the oil that the old system uses is mineral oil. The new system uses R-410A which uses synthetic Polyolester Oil. Even if the contractor says the lines could be cleaned with R-11, in reality, they never get 100% clean (It has to do not with the procedure of cleaning the lines or the effectiveness of the cleaning process but for the way this cleaning process is performed in the field. Unfortunately it varies from contractor to contractor). If the new oil and Freon run on these old lines it may get contaminated causing other issues down the road. Add also the corrosion these lines had been exposed inside the chase or under the ground in many cases, also, the new Freon R-410A operates at higher pressures than the current one R-22. There is cases in which running new lines is practically impossible, for example: The lines are installed between floor spaces, inside walls or there not enough space in the attic, or they cannot be exposed. In those cases cleaning the lines with R-11 is recommended. Make sure the contractor have enough R-11 and Nitrogen to perform the process. Once the system is up and running for 48 to 72 hours have the contractor come back and replace the Liquid Line Drier and perform an "acid test" to corroborate the lines are clean and not contaminated, recover the current Freon charge and put new Freon in the system. After all it's all under Labor and Parts Warranty. 3- It is extremely important to modify the duct system by increasing the return intake capacity and potentially improving the supply side to accommodate more air flow movement and volume. Avoiding the modifications to the duct system is equal to condemn the new HVAC system from day one, simply like that. New HVAC equipment today is manufactured under different guidelines and design. The principle is the same, the appearance of the equipment is also the same but the manufacturing guidelines referring efficiency are totally different compared to equipment manufactured five, ten or fifteen years ago. New equipment is more energy efficient, air handlers move way more amounts of air flow and with the new ECM Variable Speed Motors and Two Stages Compressors if you do not modify the existing duct system, then I guarantee you that the energy that the new HVAC system is supposed to save is going to be wasted away and your power bills are not going to be as low as you expect, the recovery of the investment you will do in installing this new HVAC system is going to take longer than normal simply because the equipment is not working as efficient as the way it was designed. Not modifying the duct system is equal to not having good air movement, humidity control and equal temperature and air distribution inside the house. It is extremely important to modify your duct system in order to accommodate the new HVAC system. This is important. 4- Make sure the Technicians who will perform the job are NATE Certified Technicians. Not all companies have NATE Certified technicians in their staff. The industry is making great effort in making sure all HVAC&R technicians get NATE Certified. It is becoming a Standard and that is really good for the industry and YOU, THE CONSUMER. 5- Avoid your equipment to be installed by technicians working "on the side" or not having a Contractor License. Unlicensed work is a plague that damages this industry. Unlicensed technicians do not care about you, they only care about the money they can make out of you. They usually disappear once the job is done and the money collected. They cut as many corners as they can in order to get the job done fast, their work always leave consequences, bad for the equipment being installed and bad for your wallet in the long run. They usually charge cheaper than a licensed contractor but the quality of the work they do is really bad. They usually don't guarantee the job they do even if they say to you that they will. NATE means North American Technician Excellence. This organization encourages the use of NATE certified technicians for superior installation, maintenance and service of HVAC and refrigeration systems. NATE certified technicians have proven their knowledge in the HVACR industry by passing a rigorous specialized NATE certification tests. This means PROTECTION for you as consumer knowing that the technician performing the installation will do it right the first time. The best way to know is by requesting their NATE ID before doing the job. This license is personal and not transferable. Here at North Pole Air Conditioning and Heating Services, Inc. we all are proud to be NATE Certified Technicians. This is important. Follow these tips that I am giving you. I am not trying to influence you in any ways but I feel as a professional service technician that you, consumer, need to know before taking such an important decision. To install an HVAC system is a complex process, materials and labor intensive, really technical. Not too many people can do it and do it right. Many people believe that setting a condenser or air handler, doing some welding and put some Freon into the system is all the knowledge they need to accomplish such task. Installing an HVAC system requires a lot of technical knowledge and high professional skills. Installing an HVAC system has a VALUE, it also brings VALUE to your home. With our two years labor and craftsmanship warranty on new installations, length of warranty time not given by many companies in Central Florida as far as we know we assure you, consumer, that the job completed is performed with the highest standards of quality. Not everyone does it right like North Pole Air Conditioning and Heating Services, Inc. Here at North Pole Air Conditioning and Heating Services, Inc. we want to let you know that we are here to serve you. We are in business to SERVE and give what people want most: COMFORT. An "A" rated BBB Accredited Business since 2012.